Did you know that the water cycle includes ice and snow? Every elementary student learns about this cycle, yet water storage in glaciers, ice sheets, and snow is often excluded. 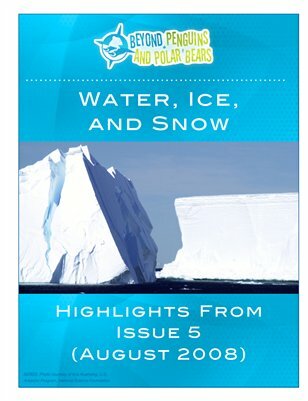 In this issue, we'll examine what the polar regions can teach us about the water cycle and the states and changes of matter. We'll trace the water cycle through the many forms of water, ice, and snow found in the polar regions and will highlight lessons that provide hands-on experiences with these forms. Science notebooks - permanent records of learning and tools for integrated literacy and science - are the literacy focus of the issue.